NAMI San Antonio is Growing! During our fourth quarter of last year through March 2018, the NAMI San Antonio Board of Directors conducted a search for a new Executive Director. We're pleased to announce that Terri Mabrito has joined our staff effective April 16. Terri has had a long and diverse career in the San Antonio community in a variety of settings including St. PJ's, the Center for Health Care Services, and, most recently, as the Child Welfare Director at Voices for Children of San Antonio. In her new role, Terri will oversee the office and will report to the board. We are excited to begin this next chapter for NAMI San Antonio and this new phase of Terri's career! Speaking of GREEN! May is Mental Health Month with a focus on youth and children; and green is the color for Mental Health Awareness Month. Please wear green as often as you can this month and share your support of our mission and family of volunteers, staff and members touched by mental health. Share your "I wear Green Because..." photos on Facebook by posting to our Page or sharing on your own and tagging NAMI San Antonio ! We're growing! As we see the need for increased capacity to respond to the community, we have evaluated the strengths and skills of our staff and volunteers. 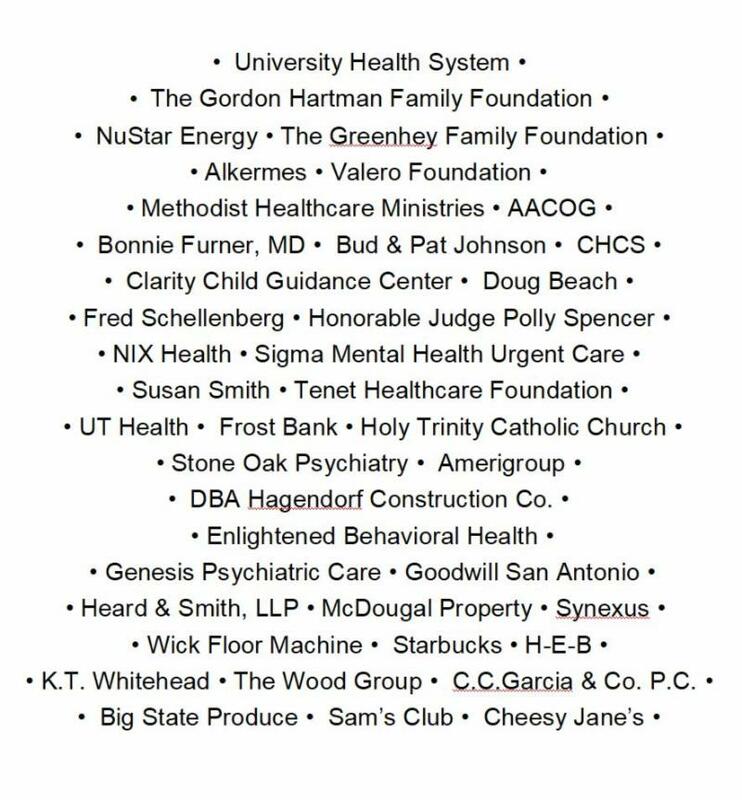 We are fortunate to have the support from our members, our sponsors, our partners, and our Board of Directors to grow to meet those needs. We have recently both added staff and redefined existing positions. Terri has over 30 years experience in programming and services for children and families, working in a variety of faith based, educational, and social service settings in San Antonio. 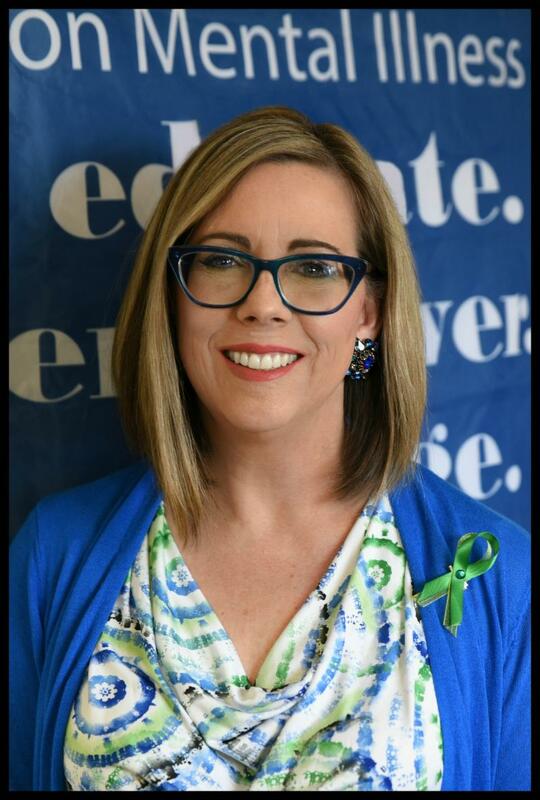 She has been recognized for her advocacy work in child abuse prevention and children's mental health. Terri and her husband of 37 years have three grown children. They enjoy going to concerts, visiting national parks and heading out to the Hill Country whenever they can. In her new role as Executive Director, she will bring her expertise to help NAMI San Antonio continue to grow! ﻿ Kimaura Oztolaza served in the U.S. Army for over 22 years with distinguished service. During her military career, she has held various positions of increased responsibility with the National Security Agency, Defense Intelligence Agency, the North Atlantic Treaty Organization and culminating her career working for the AT&L, Under Secretary of Defense, Pentagon. Upon her retirement from the U.S. Army, Kimaura moved to San Antonio, TX. She became a volunteer and advocate in mental health after one of her own children was diagnosed. While volunteering at NAMI San Antonio, her determination, dedication and leadership skills lead her to become permanent member of the NAMI San Antonio team. Kimaura has effectively kept our NAMI office running smoothly and has provided exemplary leadership to the day-to-day internal and external activities. 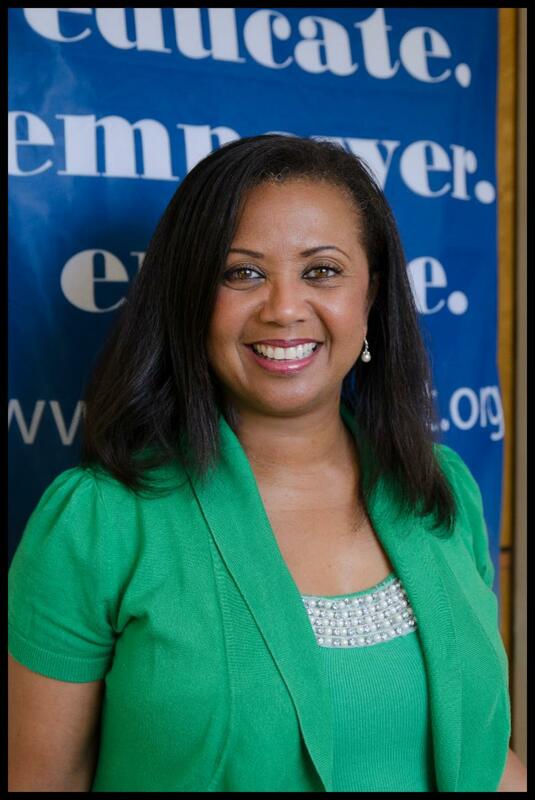 We are delighted for her to continue as our Director of Operations. 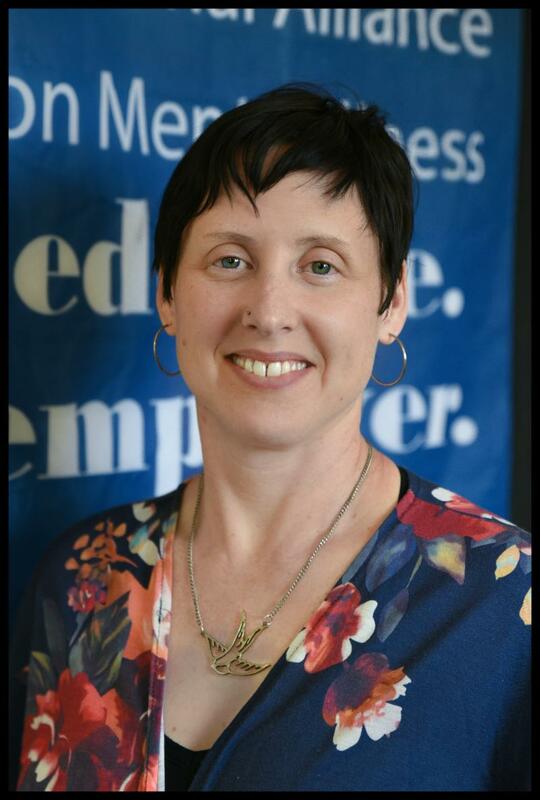 ﻿We are so happy to announce that Verna Lister, after successfully growing our Education Programs, will bring her knowledge and skills to the important task of Outreach. 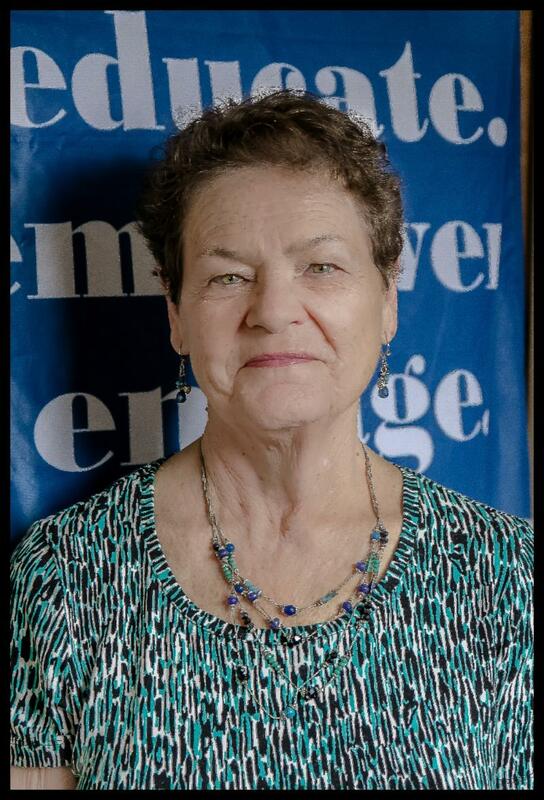 Verna's many years of experience in sales, with the NAMI Signature Programs, and her own lived experience will serve her well as she moves into her new role as Outreach Coordinator. We have added Melisa Riley to support our education activities. Melisa has a BA in Spanish and an MA in Education from West Virginia University. She has worked for 6 years as a Spanish teacher & established a Native Speaker program for New Hanover County. She also worked for 10 years as an interpreter for DHHS. She is currently working towards her PsyD. Melisa moved with her husband to San Antonio May of 2017 from Wilmington NC and enjoys spending time with her 15 pound rescue dog. 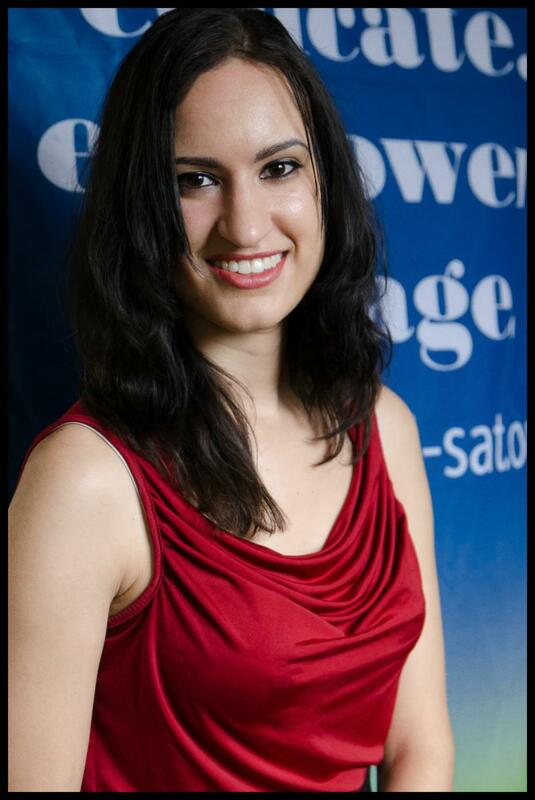 She is already doing an amazing job as our new Program Coordinator (Education). Coral Martínez-Cardona will lend her experience and skills to managing all NAMI San Antonio upcoming events; scheduling community health fair and presentation commitments, and coordinating volunteer tasks and hours. She is also our resident Photographer and overseas our website and social media platforms. 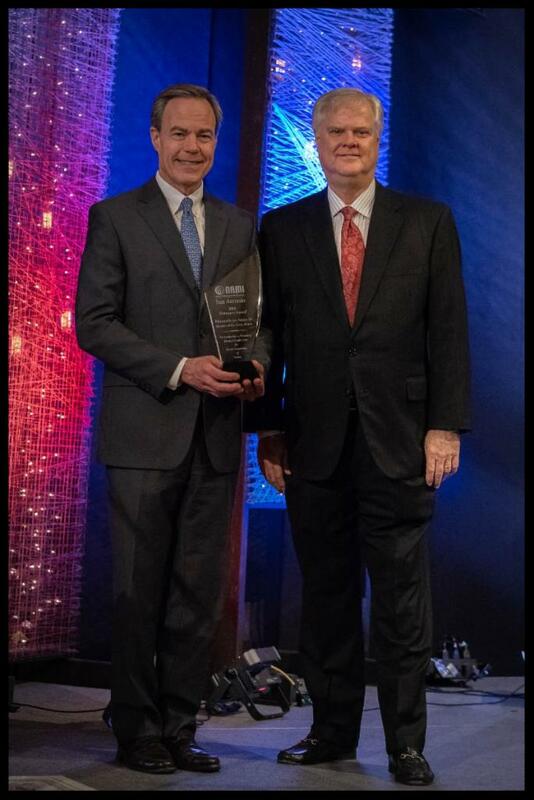 On April 4th, NAMI San Antonio awarded Speaker Joe Struas III its 2018 Visionary Award for his leadership during the 85th Texas Legislative session. As a result of his leadership, Bexar County will receive over $400 million in increased mental health funding including $300 million to rebuild and replace the San Antonio State Hospital (SASH). Over 200 people attended the awards luncheon held at First Prebyterian Church for the 5th Annual NAMI San Antonio Visionary Awards Luncheon. We have begun the new year with more classes scheduled than at any time in our history. In order to meet our 2018 class program schedule we will provide more training opportunities for each of our signature programs. 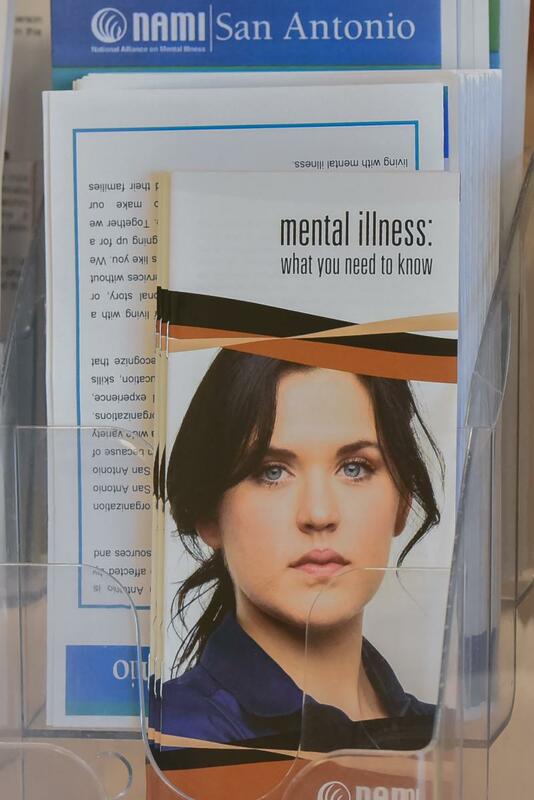 In addition, we will offer new NAMI programs like Ending the Silence. Please join us at our next NAMI General Meeting on June 12, 2018 at 11:30 am. RSVP by calling the NAMI Office at 210-723-3339 to make a reservation. 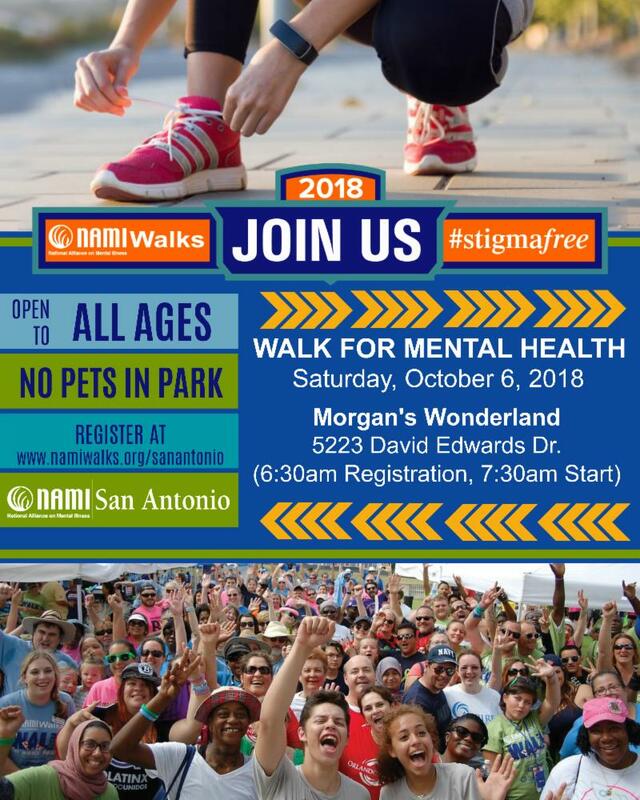 ﻿This year we will hold our annual NAMIWalks at Morgan's Wonderland on October 6, 2018. Registration will open at 6:30 am, the event will begin at 7 am, and we will start walking at 7:30 am. 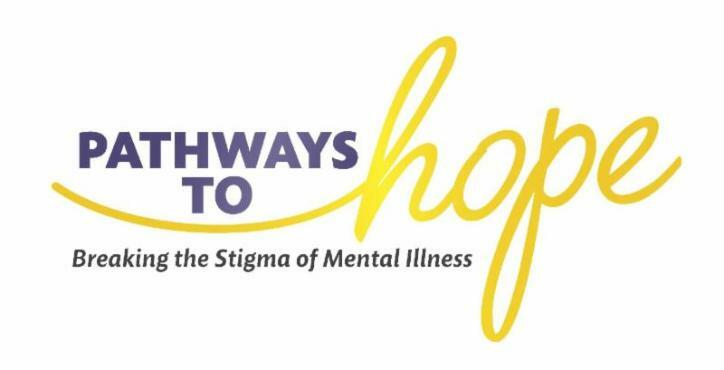 NAMI San Antonio will help support this year's Pathways to Hope Conference: Breaking the Stigma of Mental Illness, on August 24 & 25. The Conference is free and will bring people together from across our community to focus on programs and speakers in four different tracks: Mental Illness and Addiction; Peer and Community Support; Therapy and Counseling; and Faith Community Support. You can register for the conference HERE. In addition to the workshops, we will have outstanding plenary speakers from across the U.S. including Pulitzer Award winner Ron Powers, author of the book Nobody Cares about Crazy, Adm. James Winnefeld and his wife Mary; and Grammy Award winner Ashley Cleveland. 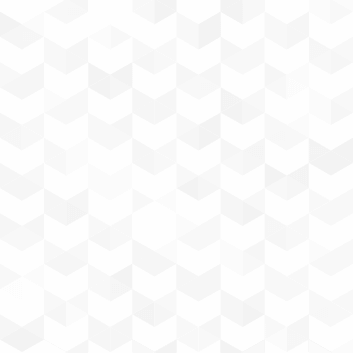 Take a look around our website and follow us on Facebook . Stay in-the-know about our educational classes, support groups, advocacy issues, and events throughout the community.